Anger is a forceful emotion that can be a leading cause of relapse in early recovery. This is why controlling anger is an important aspect of drug and alcohol abuse treatment. Individuals come to treatment full of anger and resentment for themselves and others that have betrayed them throughout their active addiction. It’s hard enough turning the stone and making the effort to live a life of sobriety through rehabilitation; anger makes it so much more difficult to accept the changes that need to be made to achieve successful recovery. However, working on anger and addiction together can help people in treatment resolve these emotions that may have led to addiction in the first place and learn to live with frustrating scenarios without reverting back to addictive behaviors. Anger is both a feeling and a response. It is not always necessarily a wrong emotion or reaction. Everyone gets angry at one time or another. When a person feels provoked because of a wrongdoing, anger is a response to injustice. For those that cannot control anger or suffer from it as a response to addiction, it can be detrimental to recovery success because it can lead to relapse and as well as other consequences. Anger can be displayed both internally and externally as a response. Internal responses include passive aggressive thoughts and words. External responses include behaving in a violent matter. 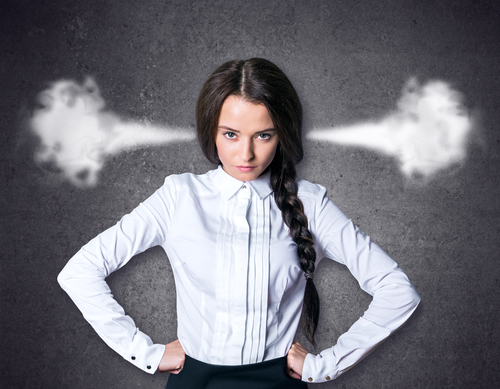 Feelings of anger can lead to mental, physical, and public consequences for those that cannot control it. Why Are Individuals in Recovery so Angry? Someone that should have been trusted has mistreated the individual in the past or the individual has experienced a traumatic experience they hold anger for. The individual is not realistic about their expectations of treatment or others. The individual does not know how to actively express their anger as a result of addiction’s effect on the brain. The individual has learned misinformed ways of expressing anger throughout childhood. The individual experiences anger as a result of their behaviors during active drug or alcohol addiction. The individual suffers from anger as a symptom of a concurring mental illness such as bipolar disorder, depression, anxiety, schizophrenia, personality disorders, and others. Broken relationships between loved ones, friends, and family. Can lead to sleep-related disorders like insomnia. May possibly lead to loss of a job if an anger response happens at work. Can be debilitating and cause exhaustion. Feelings of shame and guilt as a result of angry behaviors that lead to depression. Adrenaline, a chemical released in the body when a person reacts to anger, can cause heart-related issues if released too often. Raises the risk of illegal and harmful behaviors. Once detox concludes, those that are enrolled into drug and alcohol addiction treatment will be exposed to feelings that they would otherwise numb with their drug of choice. Anger is a common emotion among individuals in rehabilitation. Treatment is not only about changing behaviors that lead to using drugs or alcohol, it is about healing the addicted mind so that emotions can be actively felt and dealt with throughout sobriety, eventual relapse doesn’t occur, and successful recovery can be attained. Monitoring and controlling anger is a part of this. Therapy can guide individuals who suffer from anger and addiction concurrently to identify situations that provoke the emotion and responses of anger. Additionally, it helps to develop coping mechanisms to scenarios that may develop feelings and responses of anger. Being free from anger allows individuals in drug and alcohol recovery to sustain their sobriety, focus on being positive, and live a life that is healthy and balanced. If you or a loved one would like to benefit from treatment with an approach to both anger and addiction, Detoxes.net Treatment Center can help. We offer programs that include numerous types of therapies to help people who struggle with many kinds of addictions. We know that addiction affects each of our patients individually, so treatment should be designed for each patient specifically. To find out more about our addiction treatment program and therapies, please visit our website or call us for a free consultation today at (800) 232-0657.